In 2015, Brown and colleagues in Radiology launched the Radiation-Emitting SIR-Spheres in Non-Resectable (RESIN) Liver Tumor Patient Registry. 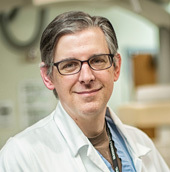 Brown has served as the principal investigator of the Vanderbilt-led research registry that tracks cancer patients whose tumors are treated with a radioactive isotope known as Yttrium-90 (Y-90). Interventional oncology uses image-guided techniques to deliver therapy through the arteries to solid tumors. During the Y-90 treatment, experts insert a small catheter into an artery in the groin and thread the catheter to tumors in the liver. Using the catheter to deliver Y-90 to the liver tumors enables the physicians to precisely target the tumors with limited effect on healthy liver tissue. The therapy is appropriate for patients whose cancer has not responded to standard therapy or has progressed despite treatment. Sirtex is the global life-sciences firm that designed the SIR-Spheres Resin Microspheres. These microspheres lodge in the microvasculature surrounding a tumor and 94 percent of the radiation inside the spheres is delivered to the tumor within 11 days. The research agreement renewal from Sirtex will provide $2.64 million over three years to support the patient registry. Combined with the original contract, reimbursement to Vanderbilt totals more than $3 million. “This updated agreement with Sirtex shows their commitment to this research project which will be the largest of its kind in the Interventional Radiology space at its conclusion. I would like to thank Sirtex Medical as well as the support staff here at Vanderbilt University Medical Center: Ursula Halmon, Catherine Gregor, Kristin Surdam and Jennifer Baker,” Brown said. The current study includes both academic and private groups with the goal of collecting real world data about the use of this device for primary and metastatic liver cancer. The registry includes tumor type, prescribed activity of radiation, any chemotherapy or immunotherapy drugs given and also includes a number of cell receptors that are treated with targeted therapies. To date, 40 medical centers are open and 982 patients are now enrolled with a goal of reaching 3,000 patients. “The updated contract will expedite the collection and review of patient data and will allow further development of the database, which will smooth out data entry and mining. This evolution of the study will enhance our abilities to publish as our data matures. “We are looking to evaluate real-world usage to identify potential combinations of Y90 and immunotherapy or chemotherapy that can be studied prospectively to improve patient care,” Brown said.